Sometimes negative press can lead to positive change in the world. That certainly seems to be the case for the car company Volkswagen (VW), which announced last Thursday an expansion of its electric charger network — developed after the 2015 VW emissions scandal — to Canada. As part of its new Electrify Canada initiative, the company will install an initial 32 high-speed charging stations across the country in an attempt to improve existing electric vehicle (EV) infrastructure and meet growing demand for EVs. Charging stations will be located near highways and in metro areas in British Columbia, Alberta, Ontario, and Quebec. They will contain an average of four units per station, including some charging stations powerful enough to provide an additional 200 kilometers of distance for an eight-minute charge, according to Autotrader Canada. The expansion comes after the early success of the similarly-named Electrify America initiative, a $2 billion investment in EV charging infrastructure that will see 2,000 electric vehicle chargers installed across the United States by 2027. It also positions VW as a leader in the EV market, just a few years after the 2015 emissions scandal threatened to destroy the company’s once-sterling reputation. The company came under fire after emissions testing in the US revealed dangerous levels of nitrogen oxides (up to 40 times the legal limit) in more than 500,000 domestic vehicles and another 10.5 million vehicles worldwide. As part of its court settlement for the scandal, VW agreed to spearhead Electrify America, and is working with several charging companies — SemaConnect, EV Connect, and Greenlots — to install units in 17 metro areas, as well as next to multi-home buildings, workplaces, and highways across the country. Unlike other car companies, like Tesla, VW’s charging stations are available to any electric vehicle owner, and not just VW owners. For VW, the move to install charging stations in Canada looks good but is also good business. Electric vehicle purchases in Canada nearly doubled between 2016 and 2017, and experts estimate that total EV sales could surpass 140,000 by 2026. 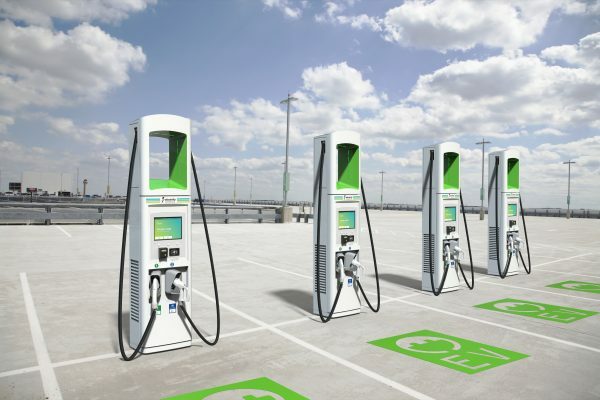 Navigant Research, a global clean technology market analyst, estimates that by 2026 EV charging unit sales will reach 80,000 across the country. Other charging companies, such as AddEnergie, have already begun to cash in on the upcoming bonanza, installing 4,000 chargers nationwide. But VW’s charging stations will come with the added bonus of 350-kilowatt chargers, which are geared at rapidly charging newer car models to be released in the near future. It has been estimated that ultra-fast chargers will surpass 250,000 worldwide by 2025. As EV growth accelerates, providing more robust charging infrastructure across the United States and Canada is a key necessity for promoting EV adoption more broadly. So-called “range anxiety” — the fear that electric vehicles will run out of electricity while on the road — continues to be a major factor in consumer hesitation to buy EVs. Because of its size, Canada’s charging infrastructure varies greatly by province, with Quebec, British Columbia, and Ontario leading the way. Quebec was the first province to support EV infrastructure, doing so through its 2012 “ELECTRIC CIRCUIT” program. Last year, Quebec also became the first province to adopt an electric vehicle mandate, which is based off California’s ZEV Action Plan. With that in mind, Canada as a country remains behind in electric vehicle adoption. In all, transportation accounts for almost one-quarter of Canada’s carbon emissions, Electrek reports. Yet, as Will Dubitsky writes for the Huffington Post, the country lacks a cohesive national EV policy, instead relying on various steering and advisory groups to determine federal policy. The federal government does offer an infrastructure subsidy program for charging units and has set a goal of an 80-percent government fleet by 2030. But EV advocates like Dubitsky contend the government can and must do more. In the meantime, VW and other private companies are helping to bridge the gap in Canada and elsewhere. And though in VW’s case this is at least partially a result of atoning for past errors, it nonetheless makes driving an electric vehicle just that much more appealing to all Canadians.